« New Toys Not Played With…Now What? Gingerbread Man Activity- No Baking Required! This past week, with the holiday season upon us, I have noticed things related to gingerbread men and gingerbread houses all around me. It reminded me of an activity I did with Andrew in one of My Obstacle Courses. One of my favorite websites to get thematic ideas and printable materials is www.enchantedlearning.com. I don’t usually use the print outs as they are unless I am working on a specific skill but I do like the literacy and math skills that they help build. 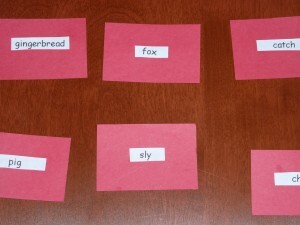 To make it more kid-friendly and interactive, I like to use thematic shapes and/or colored index cards, cutting and pasting the words and/or pictures on to create a matching activity. Words cut and pasted onto index cards cut in half. 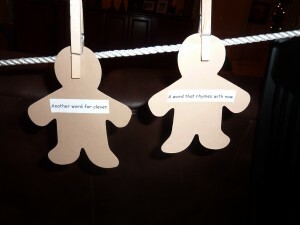 Word clues cut and pasted onto precut gingerbread men. 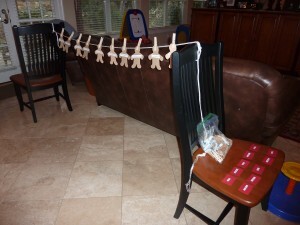 I used this as a clothesline clipping activity to incorporate fine motor skills with a literacy skill but it could also be used along with “Crawl and Match” or “Climb and Match” to combine literacy and gross motor skills.